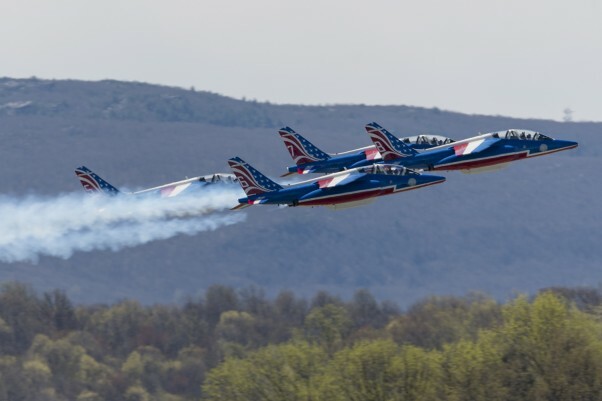 After a stop in New York and photo shoot over the Statue of Liberty in March, the French Air Force aerobatic team “Patrouille de France” once again found themselves at Stewart International Airport following the western swing of their 2017 American Tour. 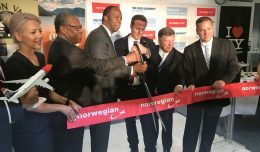 The team performed for a small crowd of VIPs and media in one of the final destinations in the United States before concluding the 12-stop tour in Canada. With their signature tricolored smoke in trail, the team enters the showbox from behind the crowd. 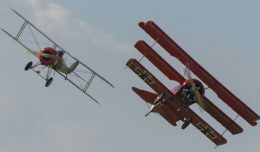 The tour included numerous performances at military and civilian airshows, flyovers, and photo shoots across the United States and Canada in celebration of the 100th anniversary of the United States coming to Europe’s aid in World War I. 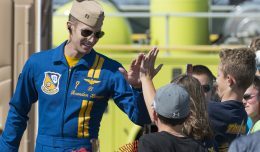 Perhaps the most noteworthy stops included visits with both the Blue Angels and Thunderbirds which featured exchange flights between the teams as well as a stop at the multinational Atlantic Thunder exercise at Joint Base Langley. 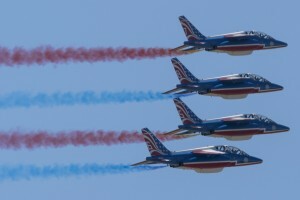 Patrouille de France crisscrossed the country with 10 Dassault-Dornier Alphajets, 8 of which fly in each demonstration, along with an Airbus A400 Atlas that provided logistics support for the team. 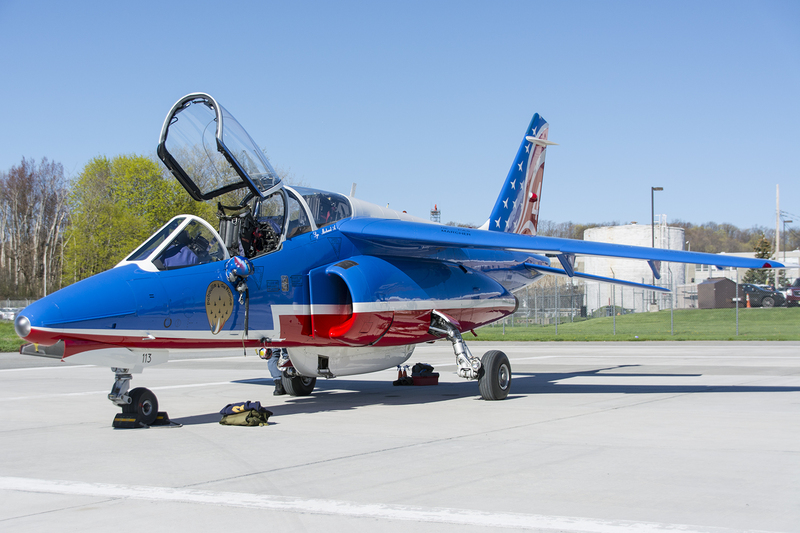 Each Alphajet was painted in a brilliant red, white, and blue livery reminiscent of the French Tricolor flag. 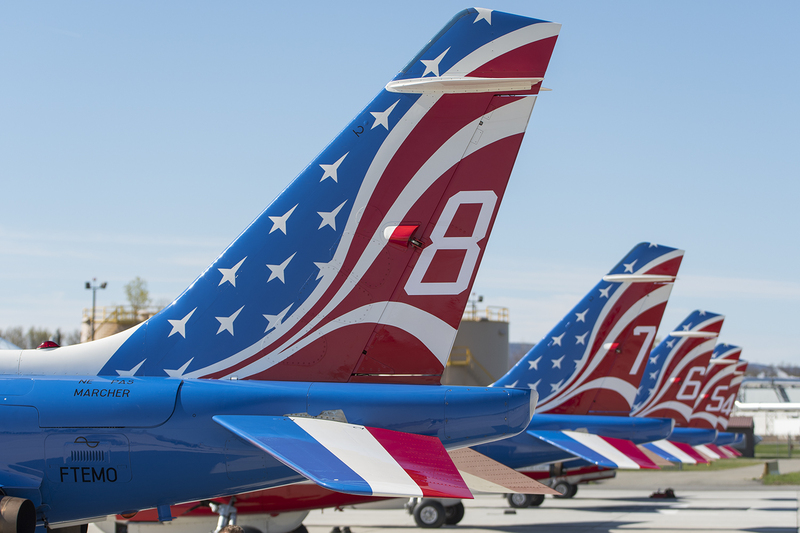 Much like the Breitling Jet Team’s recent visit to the states, the tails of the aircraft were adorned with a special livery for the tour, with a stars and stripes motif replacing the standard tricolor bars. 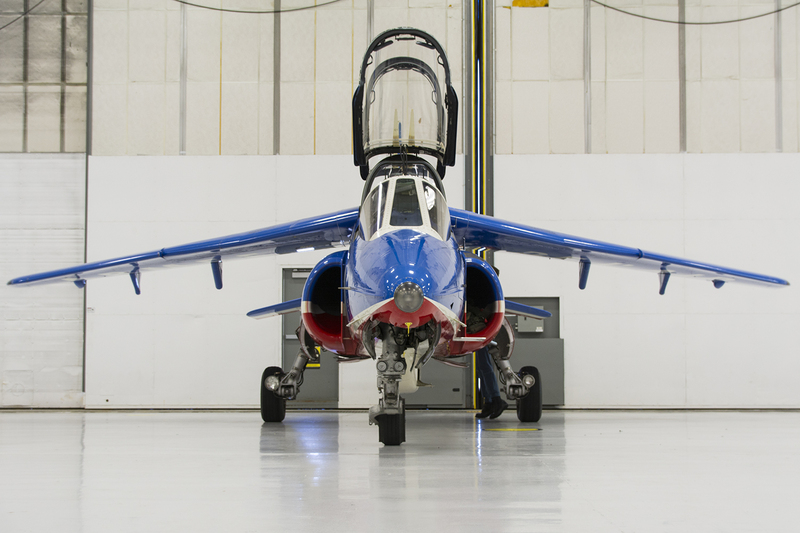 A spare Alphajet sitting in the West Point 2nd Aviation Detachment hangar at SWF. 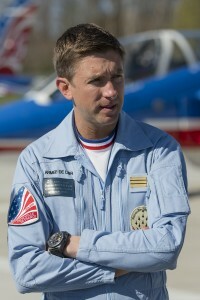 Despite the extended time away from home, the pilots were more than happy to spend time answering questions and provided insight into some of their experiences on tour ranging from the shock of touching down in -25° temperatures, to their favorite food, to their experience with air traffic control in the United States. 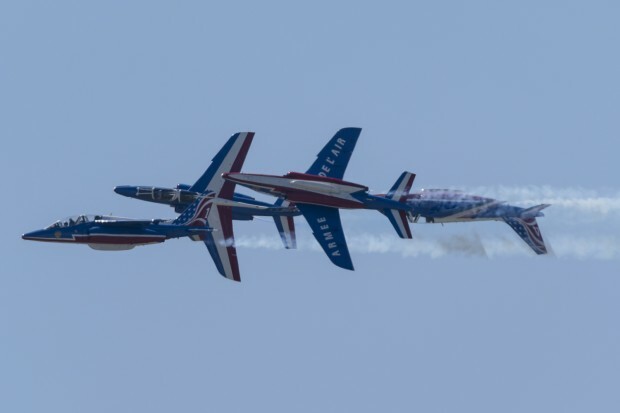 Some of the cultural differences when compared to the US based teams were interesting as well, as the Patrouille de France crew chiefs (Technicians) actually pick which pilot they have a good working relationship and stick with that pilot as they move through the formation during their 3-4 years with the team. Athos 2, Capitaine Damine Bourmaud answers questions during a media availability prior to the demonstration at SWF. Squadron Leader Commandant Christophe DuBois is in his second year as the commander of the team, which is unusual as leaders generally only serve in that position for a single season. 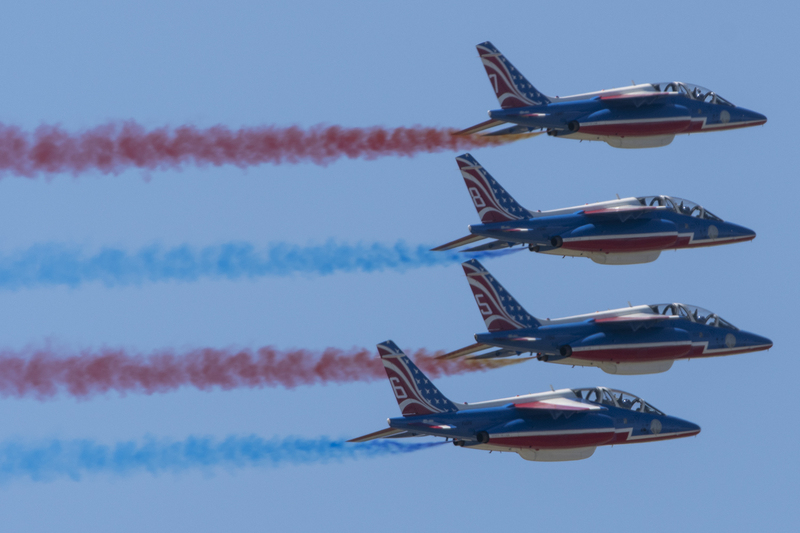 Due to the short turnaround time from the end of the 2016 season to the work up and kick-off of the American tour numerous pilots were afforded the opportunity to stay onboard and fly an extra year with Patrouille de France. Each of the 8 demonstration pilots as well as the reserve pilot have thousands of hours of tactical jet experience flying various versions of the Mirage and Rafale, and will return to front line flying following the end of their tours. A chance to perform at the Atlantic Thunder exercise along with single ship Rafale and F-22 Raptor demonstrations was a highlight for the team, with the extra pressure of performing in front of their friends on the Rafale detachment providing incentive to fly a tight demonstration according to Opposing Solo Capitaine Benjamin Chalant (Athos 8) and Right Wing Capitaine Damien Bourmaud (Athos 2). 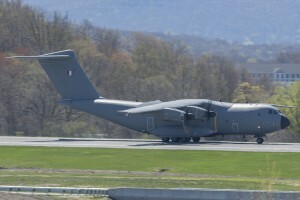 The A400 rolling out after its demonstration. 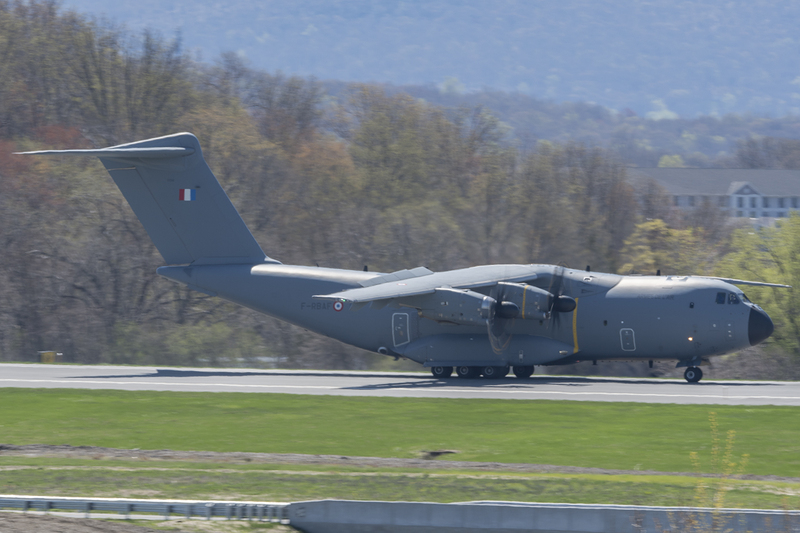 The show started with a brief demonstration by the A400M, which demonstrated some of the performance characteristics of the latest generation of tactical airlifter. The demonstration at Stewart was one of just a handful of stateside demonstrations of the A400, and gave aviation enthusiasts a rare chance to see one in action. The pilots of the Atlas did an excellent job of keeping the aircraft in view, and performed a tactical take off, steep turns, a missed approach, and a tactical landing, as well as serving as the photo ship for the numerous photo shoots the team did over American landmarks. 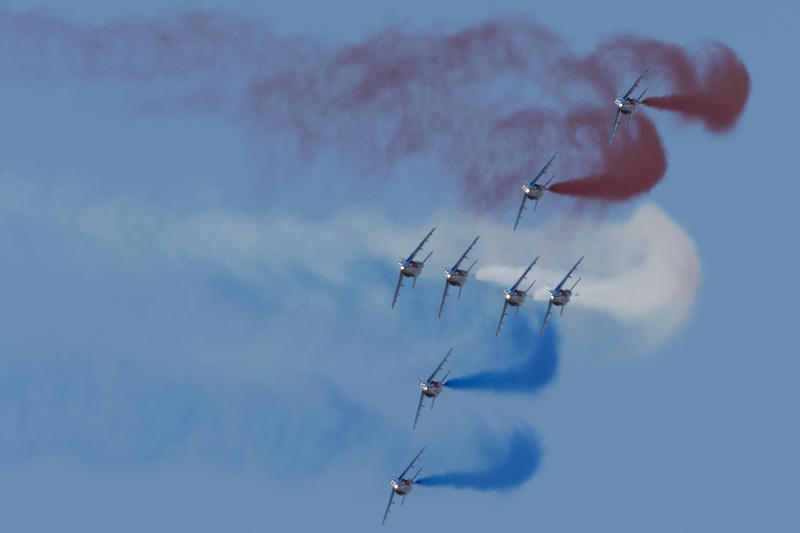 The outside wingmen and solos pass in a stacked formation trailing red and blue smoke. After the Atlas taxied off the runway the Alphajets took to the skies as a pair of four-ship fingertip formations. 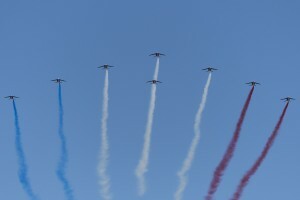 Patrouille de France began the flight portion of their demonstration from behind the crowd in a wide formation trailing the signature red, white, and blue smoke. 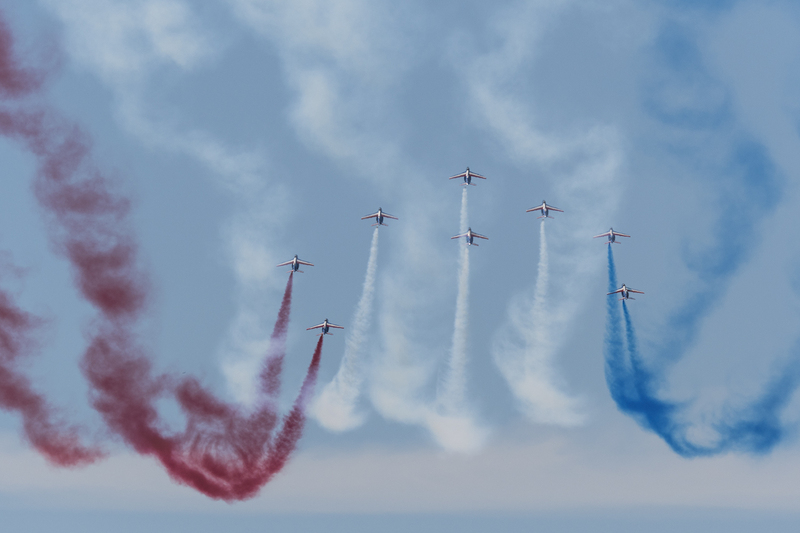 The team performed a variety of graceful maneuvers similar to the style of the Canadian Forces Snowbirds, utilizing the energy of the aircraft and large number of planes to show off numerous 8 ship formations not often seen by American airshow audiences. The #4 jet, flown in the slot position by Commandant Nicolas Lieumont is ready for the demonstration. 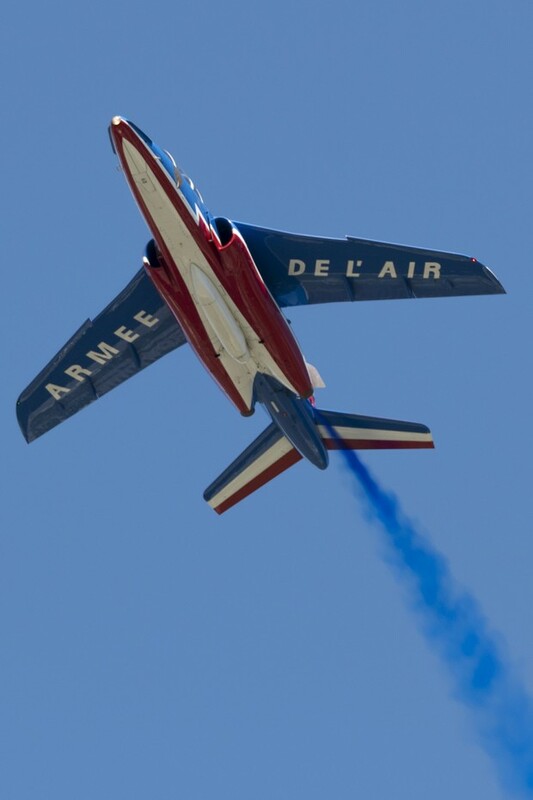 As with the CT-114s flown by the Snowbirds, the Alphajets lack the raw power and noise that you’d expect out of the Hornets or Falcons flown by the American teams, but the Patrouille de France pilots fly them with a distinctly European flair that really brings the excitement. 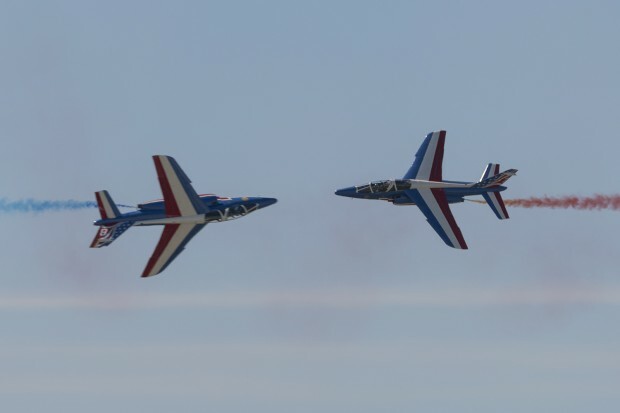 For the French pilots it was not simply enough to fly a flat formation pass though, rather the left and right wing pilots would frequently pitch up and perform a barrel roll ending up back in the formation at the end of the show line. In addition, many of their formation changes were abrupt and involved gratuitous use of the Alphajet’s rudder, which took some of the airshow veterans by surprise being used to the more deliberate, smooth, and steady changes that the Blue Angels and Thunderbirds are known for. 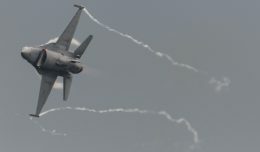 The head on opposing passes often involved four aircraft and three colors of smoke. A four ship crossover break. 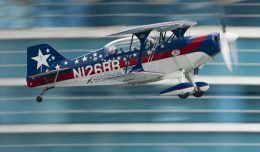 Unfortunately the team was not able to perform their full demonstration due to a limited sized show box as well as a few near-incursions into the airspace by GA pilots. 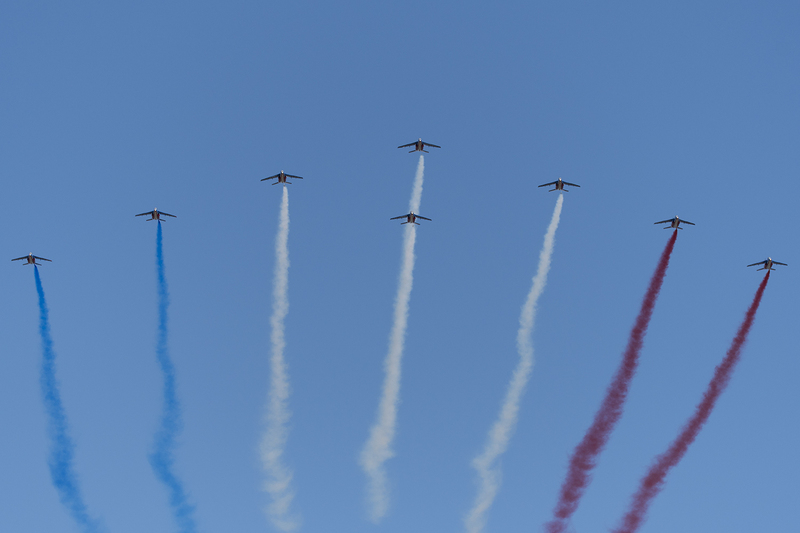 Following the flight the pilots spent time with the crowd and proved once again that they are among some of France’s finest and serve as not just outstanding aviators, but great ambassadors for France and the French Air Force as well. 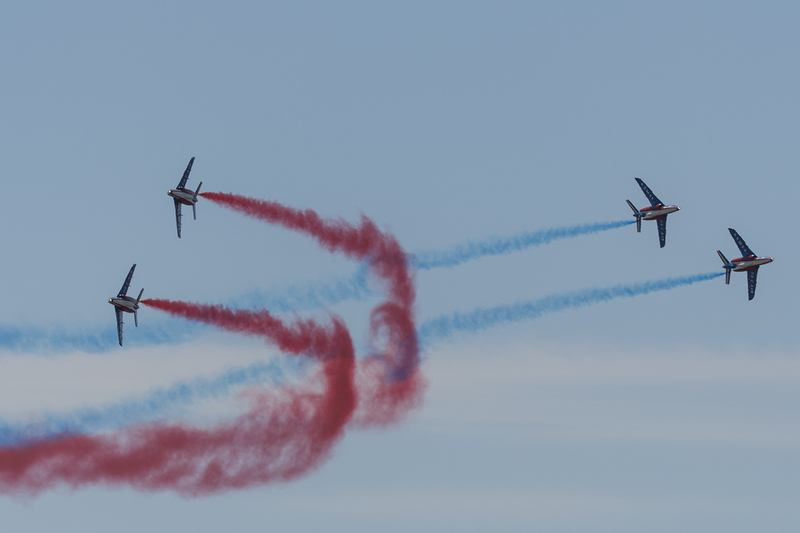 Stewart International Airport will be hosting the 3rd annual New York Airshow July 1st and 2nd, which will be open to the public and feature the US Navy Blue Angels. 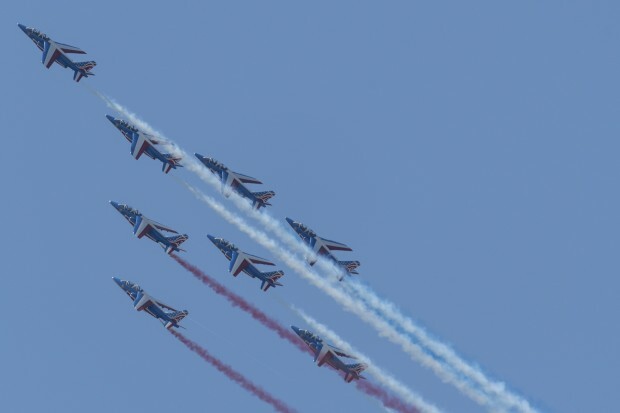 The author would like to thank the French Air Force for sending Patrouille de France to perform stateside as well as the team for being so accessible to the guests. In addition, the outstanding public affairs liaison from the 105th Air Wing deserves thanks for setting the event up! One of the signature formations, the Sheriff, with the wingmen flying knife edge and the slot pilot inverted. The two Patrouille de France solos cross while rolling at show center. An 8 ship formation of Alphajets pulling up for a roll along the show line. The team enters the show box from the right after a formation change. 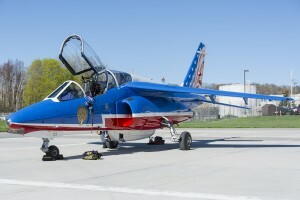 One of the jets returns to show center from behind the crowd. Patrouille de France pulling up for their opening loop in Diamond formation. Alphajets lined up prior to the demonstration flight.